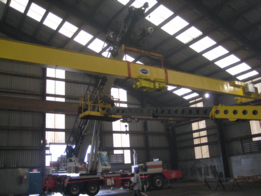 Top running CraneWerks cranes have features that are included on our equipment that are sometimes optional of other manufacturers’ cranes. 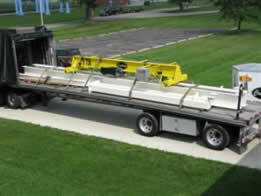 The wheels on top running bridge crane operate on either ASCE crane rail, square, or rectangular rail. They tend to have a longer wheel and bearing life expectancy than underhung cranes of the same type and capacity. A top running overhead crane offer excellent headroom advantages over other styles of cranes due to the extra lift height that is gained by having the crane girder on top of the endtrucks rather than suspended from the bottom of the trucks as in underhung applications. A top running single girder crane that require spans to exceed 60 to 65 ft. are likely to be a box girder constructed crane. Box girder cranes have a very light weight to span ratio and in many cases can reduce the size of the runway and building structure required to support them. These cranes are often referred to as mono box bridge cranes. 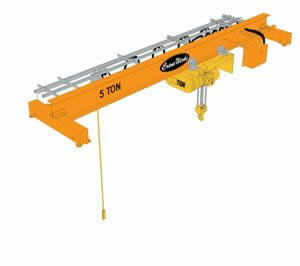 Single girder motorized bridge crane utilizes underhung hoists such as electric chain, wire rope, and air. 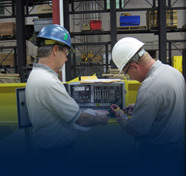 All motorized bridge cranes include air or electric festoon systems unless otherwise specified.